So it’s a mixed blessing, then, that this new Footloose is in many ways a carbon copy of the original, from Kenny Loggins’ title song playing over the same foot-focused opening credits, to the teaching Willard how to dance scene, to the choreography of the final dance, which takes place while Blake Shelton’s countryfied cover of the song plays. Does that mean the film is short on creativity? Sorta. But does it matter? I don’t think so in this case. I mean, like a decent cover version of a beloved song (Shelton’s “Footloose,” for instance), it’s still a good song, even if it’s missing a certain je ne sais quoi and doesn’t sound exactly the same. 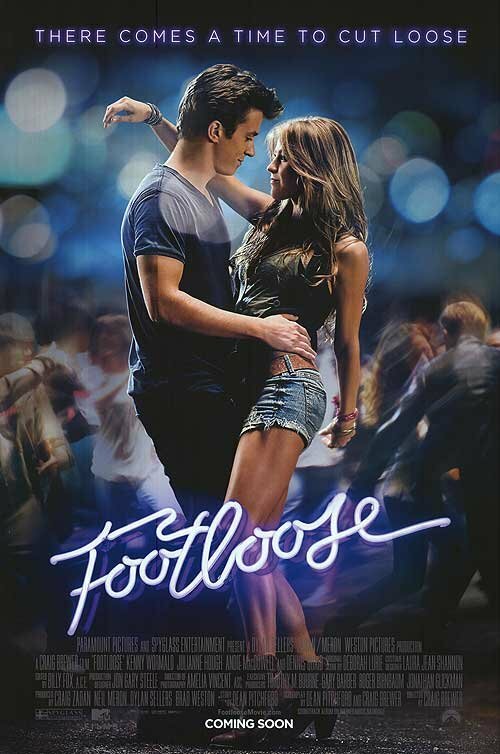 And that’s pretty much what this Footloose is: A decent cover version of a beloved movie. Like the original, this Footloose is by no means a great movie, but it does have its moments of fun. Hough and Wormald make a very attractive couple, and those songs you loved in the original still sound great (I’ll admit that my feet and hands were tapping during the opening and closing numbers, and at various other times too). Will you smile when Ren calls out those same bible verses in the city council meeting? Sure. Will you giggle with recognition when Ren throws up the confetti at the end and yells, “Let’s dance!” Totally. If you answered “no” to either of those questions, then this new Footloose isn’t for you. But if you can stomach some awkwardness and tolerate a whole lot of similarities, and if the original film occupies a sweet spot in your memories, then you may just have a surprisingly good time watching this remake. I’m giving Footloose a B.